As the competition for entry-level accounting and finance positions continues unabated, undergraduate accounting students need to look for ways to set themselves apart (i.e., differentiate themselves) in the marketplace. While it’s expected that today’s and tomorrow’s accounting students will acquire real-world, practical accounting experience prior to graduation via internships and co-op opportunities, earning professional certifications in an expeditious manner is a clear way for them to distinguish themselves to prospective employers. Two of the most valued, respected, and relevant certifications for accounting and finance professionals are the CMA® (Certified Management Accountant) and the CPA (Certified Public Accountant). Both designations signify that the holders have the education, expertise, skills, and experience to successfully handle a wide array of accounting-, finance-, and auditing-related matters. In 2007, we published an article in Strategic Finance that outlined a streamlined approach for undergraduate students to earn both the CMA and CPA designations (due to changes in the structure, format and/or content of the respective examinations, we published updates to the original article in 2010 and 2015). As noted in those articles, the ICMA® (Institute of Certified Management Accountants), the division of IMA that develops and administers the CMA exam, and the AICPA (American Institute of Certified Public Accountants), which develops and administers the CPA exam, continue to work to ensure that their certification processes are relevant and rigorous. Both examinations are regularly reviewed and revised to reflect the higher expectations and expanding roles that accounting and financial professionals will play in the future. In our previous articles, we stated that the CPA is the designation typically associated with accounting in the United States. It’s also the certification that most college and university accounting programs generally emphasize. But we find that more of our accounting students are seeking advice about careers other than public accounting. Furthermore, according to the latest U.S. Bureau of Labor Statistics report (http://bit.ly/2BvQYoI), there are approximately 1.4 million accountants and auditors employed in the U.S., of which 75% work in management accounting and academic roles. Thus, the importance and relevance of the CMA has never been more apparent. Significant changes were made to the CPA exam that were officially implemented in April 2017 and thus serve as the motivation for this article update. Accordingly, we incorporate those changes in our nine-step streamlined approach to passing both the CMA and CPA examinations within six months of graduation. Our prescribed approach is designed to show students and educators that dual certification is very attainable. Accounting certification in general and dual accounting certification in particular are financially beneficial. IMA’s 2018 Global Salary Survey found that CMAs in the U.S. earn 47% more in median total compensation than non-CMAs in the U.S. Additionally, U.S. respondents holding both the CPA and CMA designations earned even more, reporting a median total compensation 59% higher than those in the U.S. with neither certification. Just as the mantra in real estate stresses location, location, location, we emphatically stress to our accounting students the importance of differentiation, differentiation, differentiation. One clear way to distinguish themselves to employers is to earn both certifications. In addition to the financial rewards, earning both credentials demonstrates they have obtained varied skills and expertise needed in a dynamic business environment—whether it’s public accounting or private industry. It also signifies that a job candidate is highly motivated, ambitious, and committed to continuing professional education. Here we present a comprehensive plan for undergraduate accounting students to efficiently prepare for both exams at a time when they are in the best position to do so—while they’re still students. As students, they capitalize on the “freshness” of the topical content along with the fact that they’re used to taking examinations. Both are computer-based and use Prometric testing sites. Thus, the mode of delivery and assessment is similar. Both exams provide for flexible scheduling (see Table 1). Neither exam requires the candidate to have qualifying work experience to sit for the exam. Both require qualifying work experience to earn the designation. Although the CPA exam is uniform across all licensing jurisdictions, each state board mandates the specific education requirements for a candidate to be eligible to sit for the exam. All licensing jurisdictions have adopted the 150-credit-hour requirement (i.e., the equivalent of a master’s degree) to ultimately obtain the CPA license. But in most licensing jurisdictions, the CPA candidate must complete a bachelor’s degree (with the requisite number of accounting and business-related credits) to take the CPA exam. Thus, the CPA candidate can’t sit for the CPA exam while he or she is an undergraduate student. Licensure doesn’t take place until 150 hours are completed and one year of qualifying work experience is obtained. The CMA is a global credential that’s administered by the ICMA, which establishes the requirements to sit for the exam and earn this designation. Passing the CMA exam and obtaining qualified work experience doesn’t lead to licensure in a state as obtaining the CPA does. 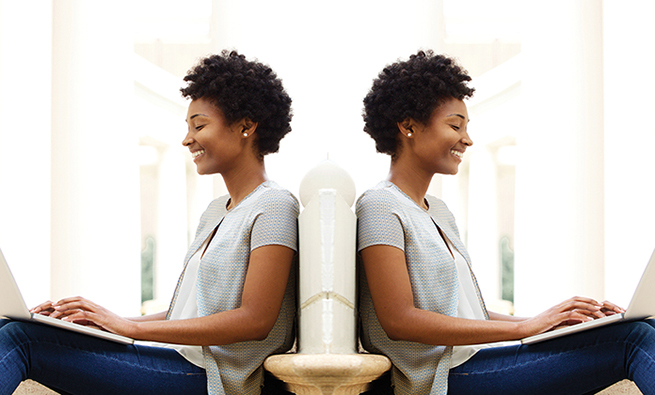 CMA candidates don’t have to complete their bachelor’s degree to be eligible to take that exam. Accordingly, CMA candidates can sit for the CMA exam while they are still undergraduate students, provided they are registered for six credits per semester during the academic year. More than 20% of CMA candidates globally are students. The ICMA doesn’t specify any number of accounting or business-related credits to take the CMA exam, but the candidate must complete a bachelor’s degree, in any area, from an accredited college or university within seven years of passing the CMA examination to be eligible to earn the designation. Our nine-step streamlined approach capitalizes on the fact that students can take the CMA exam while they’re still in school and then sit for the CPA exam immediately after they graduate. By strategically scheduling and sequencing coursework to align with the topics tested on the exam parts, students can prepare for both exams more efficiently and benefit from the content overlap between the CMA and CPA exams. Table 2 summarizes the current content areas tested on each exam, incorporating the changes to the CPA exam that became effective in April 2017. The majority of the content changes to the CPA exam involved a shift in the weights assigned to various content areas in each section per the new “Blueprints” (previously referred to as the Content Specification Outlines). 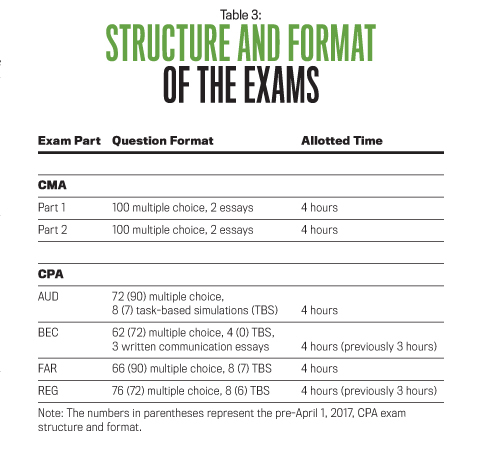 Table 3 shows the structure and format of each exam, with the new CPA exam changes in the number of multiple choice questions, task-based simulations, and allotted time for each respective part. For comparison purposes, the pre-April 1, 2017, numbers are shown in parentheses. The CMA exam was last modified effective January 1, 2015. To earn both designations, a candidate must pass a total of six parts. Take one exam part at a time to keep the workload manageable and increase the chance for success on that particular part. Take additional finance credits and/or minor in finance. 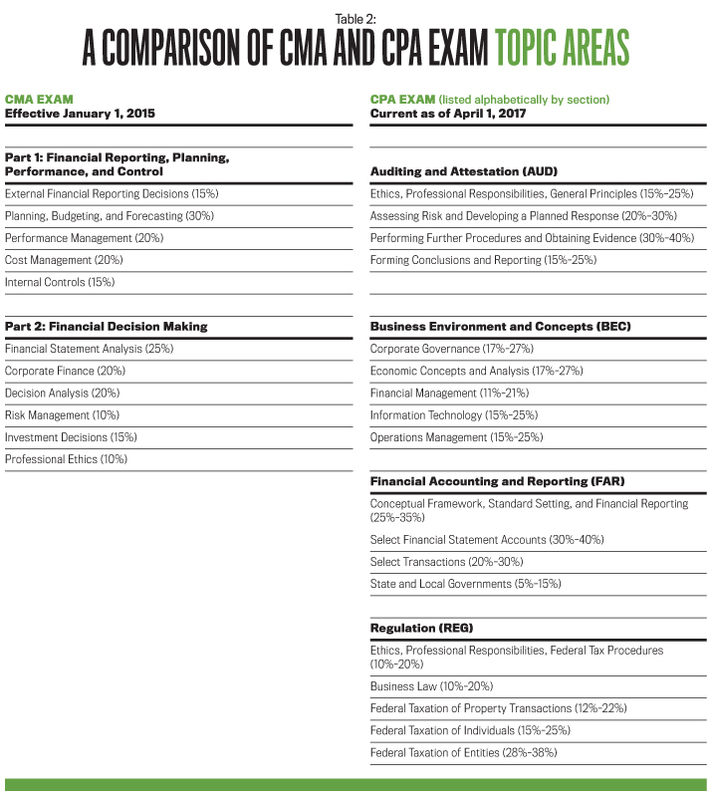 Table 4 demonstrates the alignment in content areas between the CMA and CPA examinations. The table allows a candidate to readily follow our recommended strategy for sequencing coursework and related CMA and CPA exam parts. 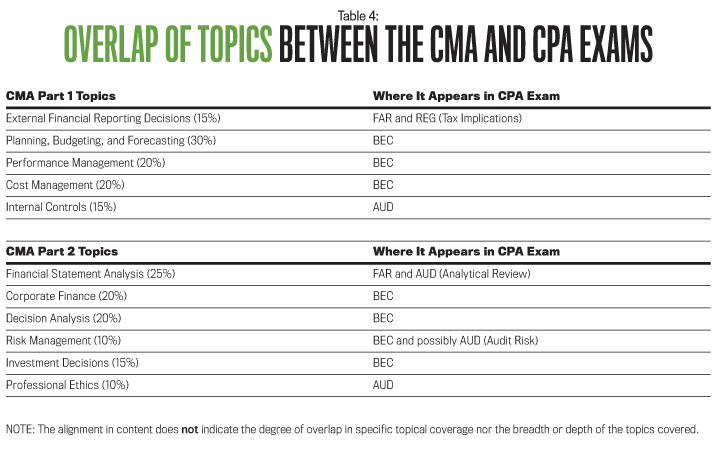 It’s important to note the significant overlap in content areas (but not necessarily breadth and depth of topical coverage within these areas) on Parts 1 and 2 of the CMA exam and the BEC, AUD, and FAR sections of the CPA exam. The CMA exam has long used Bloom’s Taxonomy. The levels tested on the CMA exam are Level A—introductory knowledge and comprehension, Level B—application and analysis, and Level C—synthesis and evaluation. Level C topic areas may also contain requirements at Levels A and B. All of the content areas in Parts 1 and 2 of the CMA exam are tested at the C level. The new “Blueprints” to the Uniform CPA exam use Bloom’s Taxonomy to assess four skill levels on each section of the exam: remembering and understanding, application, analysis, and evaluation. Each section of the exam tests the first three skill levels at varying degrees; only the AUD section tests at the evaluation level. The CPA exam adopted Bloom’s Taxonomy to emphasize the higher-level application and analysis skills that are consistent with employer expectations for an entry-level accounting professional. A student who pursues a minor in finance or takes additional credits beyond the traditional required corporate finance course will be better prepared for both exams because advanced-level finance courses typically incorporate case analyses, which require the use of higher-order thinking skills such as application, analysis, synthesis, and evaluation. Since most undergraduate accounting curricula include some free electives, taking additional coursework in finance is feasible. These additional finance credits will count toward the 150-credit-hour requirement for CPA licensure. Our updated plan is outlined below and summarized in Table 5. During his or her junior year, the student completes the intermediate accounting sequence (usually two courses), corporate finance, an information systems course, operations management, business ethics, and, if possible, a relevant finance elective. We expect that most accounting majors will have completed coursework in economics and quantitative methods (statistics) by the end of their junior year. The CMA exam assumes that a candidate has knowledge in business economics, time value of money concepts, statistics, and probability. (Note: the BEC section of the CPA exam specifically tests economics and time value of money concepts.) The totality of this coursework covers the majority of the topics tested on Part 2 of the CMA exam and is invaluable in preparing for this part of the exam. 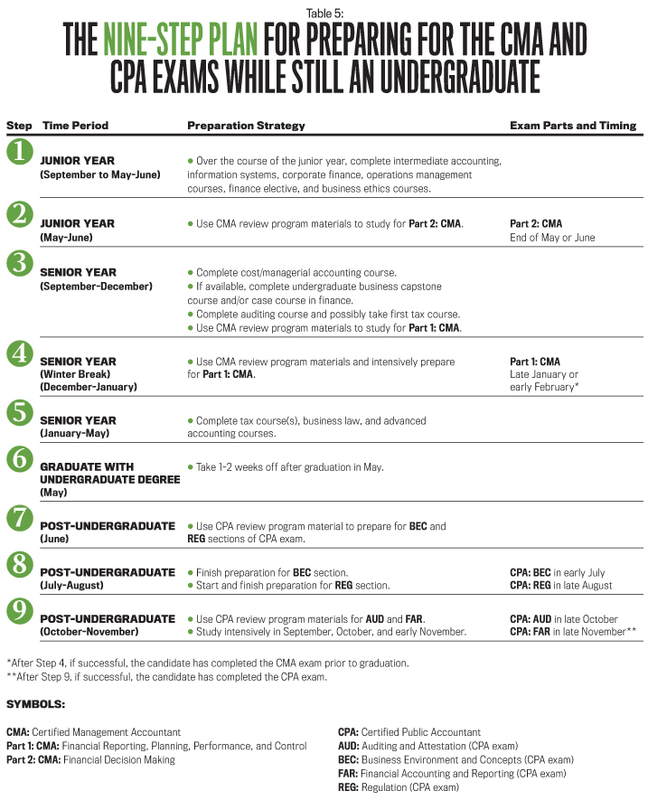 In May and June, after the junior year is complete, the student uses the CMA review program materials to prepare intensively for Part 2 of the CMA exam: “Financial Decision Making.” The student takes this part of the exam in late May or June and then recharges in the months of July and August. During the first semester of the student’s senior year, the student completes cost/advanced managerial accounting, auditing, and the undergraduate business capstone course, if available. Typically, capstone courses are case-oriented and require application and integration skills (Level C) to examine budgeting, forecasting, performance, and control issues, which are invaluable in preparing for Part 1 of the CMA exam: “Financial Reporting, Planning, Performance, and Control.” If such a capstone course isn’t required or available, the student should look for a case course in finance (elective). At this point the student will have completed three years of college in an accounting program and should have a solid foundation in most of the topics tested on Part 1 of the CMA exam. Over the winter break (January), the student uses the CMA review program materials to study for Part 1 of the CMA exam and plans to sit for this section in late January or early February of the spring semester. We recommend this timing because it’s early in the spring semester and likely before major course assignments are due. If the student is planning on doing an internship in the spring semester, we suggest that he or she request that it begin in late January. If the student is successful up to this point, he or she will have completed the CMA exam prior to graduation in May or June. This is quite an accomplishment and should serve as further motivation to aggressively pursue the CPA exam once the student graduates. It’s also a tremendous confidence builder; the student now knows that he or she can pass a rigorous professional examination! Note: Obviously, the total amount of study time needed to pass these two parts will vary per candidate. Based on our prescribed timing and sequencing of coursework, most of the topics covered in the recommended courses are quickly reviewed and reinforced in a timely manner with the CMA review program materials. As a result, we expect the total study time to be less than it would otherwise be if the student took these two parts after graduation. During the second semester of the student’s senior year, the student schedules tax, business law, and advanced financial accounting courses. If this isn’t possible, he or she should take the advanced and/or tax course in the first semester of the senior year. Ideally, the student should take two tax courses: individual taxation and business-entity taxation. If available, one tax course could be taken per semester. Although it isn’t common, a second auditing course would also be useful. 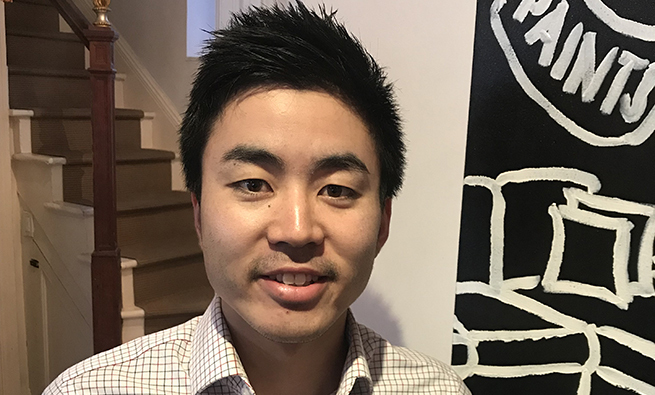 After graduation in May (with his or her degree and CMA exam completed), the student candidate immediately applies for the CPA examination, parts BEC and REG, and then relaxes for one to two weeks. In June, the candidate uses the CPA review program materials to prepare for the Business Environment and Concepts (BEC) section of the CPA exam. Because the candidate recently studied for the CMA exam, the preparation time for BEC is considerably shortened since financial management, information systems, and operations management (representing 41%-71% of the BEC section) were already covered and tested on the CMA exam. The candidate schedules the BEC section in early July. For the remainder of July and early August, the candidate uses the CPA review program material for the Regulation (REG) section. If he or she completed the business law and tax course(s) in the senior year as we advised, 75%–90% of the content tested on the REG section will be relatively fresh in his or her mind, reducing the amount of study time needed. The candidate schedules the REG section at the end of August. While steps 1 through 8 were challenging, the real test of the candidate’s dedication, motivation, and commitment is now at hand, particularly if the individual is starting his or her career in the fall after graduation. To capitalize on the fact that the candidate completed the auditing and advanced financial accounting courses in the senior year, he or she uses September and early October to prepare for the Auditing and Attestation (AUD) and Financial Accounting and Reporting (FAR) sections of the CPA exam concurrently.The candidate gains synergy when studying for AUD and FAR together since audit issues such as analytical procedures, which involve ratio analysis and a thorough understanding of financial statement preparation in accordance with U.S. Generally Accepted Accounting Principles (GAAP), are tested in both sections. And with the emphasis on external financial reporting in Part 1 of the CMA exam, the candidate will have reviewed and been tested on many of the intermediate accounting topics tested in FAR, while many of the analytics and financial ratios covered in AUD were tested on Part 2 of the CMA exam. The candidate schedules AUD in late October and FAR in late November. This strategy affords him or her an additional month to review the material in the FAR section. This timing is also desirable because it’s before calendar year-end corporate closings and the public accounting “busy season.” If successful, the May accounting graduate will complete both exams by late November, six months after graduation! In summary, candidates following this nine-step plan will take one exam section at a time (two while a student and four shortly after graduation), thereby capitalizing on the timing of their coursework, test-taking ability, and professional exam experience. All this should improve the likelihood for success on both the CMA and CPA exams. Nevertheless, we recognize that this nine-step plan is extremely ambitious and may not appeal to all accounting students even though it’s a viable choice for those who are highly motivated and dedicated (e.g., honors students). It may also appeal to students who plan to go straight to graduate school to earn their 150 credit hours. Students majoring in accounting and taking additional coursework in finance are ideal candidates. Academic institutions should consider providing incentives to their “best and brightest” by offering to underwrite exam costs. 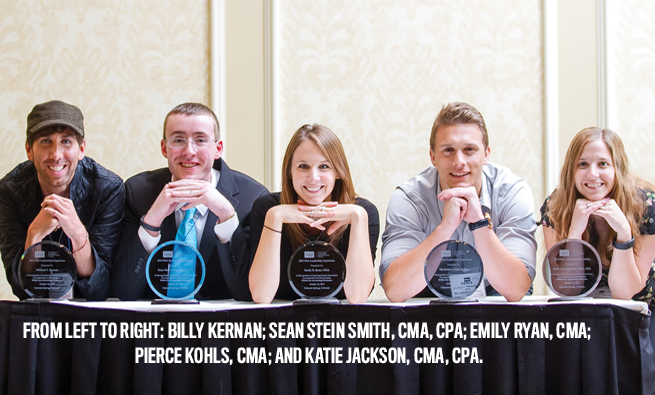 IMA offers a substantial discount for students who take the CMA exam along with scholarships to outstanding accounting students. These scholarships reduce out-of-pocket tuition costs and can make the CMA review program more affordable. If an institution underwrites the cost of the CMA exam and/or CMA review program, its investment has a triple future “payoff” or return. First, improved success rates on professional accounting exams are direct measures for undergraduate accounting programs with outcome-based assurance of learning criteria. Second, students are more likely to endorse accounting programs where they received such support and goodwill. Third, those students who successfully follow our plan will have passed the CMA exam before they start their employment or graduate studies, making them more valuable to their employer, which leads to a higher demand for the institution’s accounting graduates. 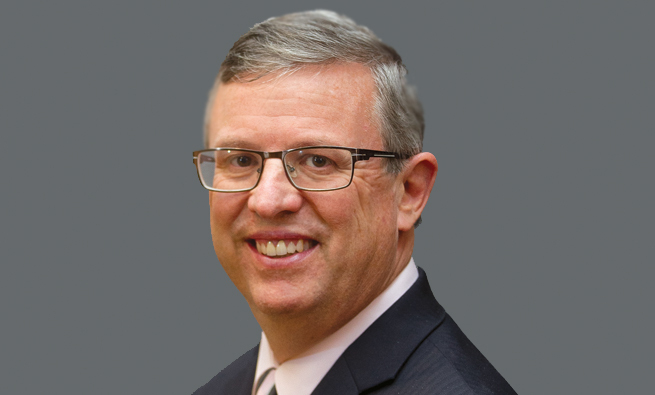 Joseph M. Hargadon, CMA, CPA, Ph.D., is a professor of accounting and coordinator of the undergraduate accounting program at Widener University in Chester, Pa. He also is a member of IMA’s Greater Philadelphia Chapter. You can reach him at (610) 499-4280 or jmhargadon@widener.edu. 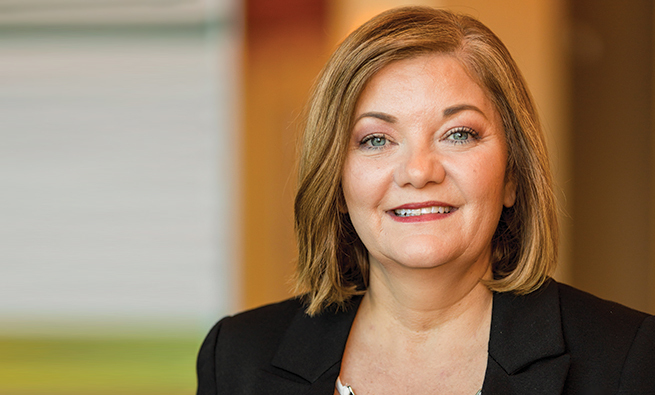 Lori R. Fuller, CPA, Ph.D., is a professor of accounting and associate dean at West Chester University and is a member of IMA’s Wilmington Chapter. You can reach her at (610) 436-2377 or lfuller@wcupa.edu. I liked the article. It gives me something to think about. can you share sum more details. The following statement appears to be one of the key points of the article as to why CPAs should pursue CMAs, “IMA’s 2018 Global Salary Survey found that […] U.S. respondents holding both the CPA and CMA designations earned even more, reporting a median total compensation 59% higher than those in the U.S. with neither certification.” However, as a potential CMA candidate, what is the benefit in terms of % increase in salary of CPAs who also earn CMAs over their CPA-only competition? This is the key metric that would persuade CPAs to also pursue a CMA certificate. NOTE: You’ll find the answer in IMA’s Global Salary Survey for 2018: http://sfmagazine.com/post-entry/march-2018-imas-2018-global-salary-survey/. Look for Figure 3 that compares CMAs and CPAs. Am icma and MBA student also but now I want to be a CMA .. But I have no idea what I am do. I am serious about it. Plz suggest any easy and valuable suggestions. NOTE: Please go to https://www.imanet.org/cma-certification?ssopc=1 for more information on the CMA. NOTE: The CMA is a certification from IMA, and the CPA is a certification from AICPA–two separate associations.